Sometimes you’ve just got to get away from the hustle and bustle of the city to enjoy the serenity of a national park. 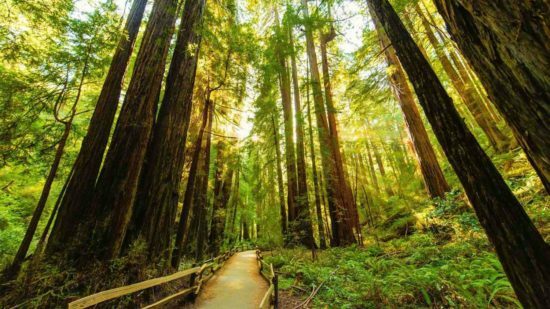 On certain “fee-free” days throughout the year, enjoy free entry to all national parks and monuments including Muir Woods and Yosemite National Park and free admission aboard all of the historic vessels at the Hyde Street Pier of SF’s Maritime National Historical Park. Check out all the fee-free national parks in the nation. The National Park Service now offers five free days a year. All National Park Service sites that charge an entrance fee will offer free admission to everyone. National parks are America’s best idea, and there are more than 400 parks available to everyone, every day. The fee-free days provide a great opportunity to visit a new place or an old favorite, especially one of the national parks that normally charge an entrance fee. The others are free all the time. The entrance fee waiver for fee-free days does not cover amenity or user fees for activities such as camping, boat launches, transportation, or special tours. In addition, any fourth grade student can get a free annual pass through the Every Kid in a Park program, and active duty military and citizens with a permanent disability can also get free passes. For more information about the variety of discounted passes available, please visit the America the Beautiful National Parks and Federal Recreational Lands Pass page.